Quentin Fenton Herter THIRD “was seldom seen and never heard./He always did what he should ought/and NEVER did what he should not.” This Quentin cleans his plate and always remembers to say please. But Quentin has a shadow–“never good and always bad.” Quentin’s shadow spills his pudding on the floor and writes with crayon on the door. 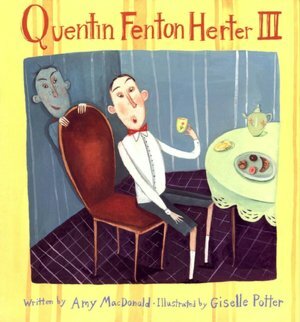 “Oh he was bad as bad can be,/was Quentin Fenton Herter THREE.” The two Quentins dislike each other, until one afternoon when something very unexpected happens right in the middle of a fancy tea party. The result should delight both good (and naughty) children alike. My mother once confessed to me she wanted to write a story about a little boy who was so good that he bored his mother to tears. She and I came up with the first line of the story together many years ago. Strangely enough, my own two sons are a little like the two Quentins.